That’s how I feel about what I am going to tell you. Now, I might be getting a little over excited. It could be I’m blowing this out of proportion, but honestly I’ve been waiting for something like this for awhile. For about a month I’ve been giving a few of you hints about this. I had a meeting with the owners of a new establishment coming to downtown, and they gave me the go ahead to break the news. Knoxville is getting a new craft beer bar. Specifically, Knoxville is getting it’s first craft beer bar that is going to specialize in high gravity beer! It’s called Suttree’s High Gravity Tavern. It’s located in the space between Downtown Wine and Spirits and Morelock Music on Gay Street. It’s currently under construction with a projected opening the last weekend in April. I saw the plans and this place is going to be really nice! They are building it with craft beer fans in mind. It’s purely a bar (no kitchen) but they do plan to provide snacks for the thirsty and also to have something to help clear your palate between rounds. There are some details still being worked out such as the number of taps they’ll have (I’ve heard anywhere between 16 and 40 being discussed) but I was assured a majority would be high grav. There will also be a display cooler of rare and exotic beers as well. I was shown the design and can describe the decor as simple yet elegant. The back wall will have a little stage for music. This will not be a tv bar, but they do plan to have a 100 inch screen in the back. However, I was told it will only really be turned on for big sports games and the occasional movie night. I can’t wait for this place to open, and really hope it does well. If you are a craft beer fan, you’ll love this place. Moving on to something else I’m a little more involved in. I’m teaming up with The Casual Pint to bring Knoxville it’s first ever beer infusion night. This is going to take place on Wednesday March 28 from 6-9pm. For those not familar with beer infusing, let me explain. We will be taking a keg of Woodruff’s Porter and running it through a randal packed with cocoa nibs and shredded coconut. The beer takes on those flavor characteristics. I did this at home months back when I first got my infuser and it was amazing. The beer seriously tasted just like a mounds candy bar. Other cities have been doing infusions for awhile. Asheville Brewing Company is famous for their once a week infusion night, where they blend unique flavors. One of the infusions became so popular, customers demanded they add it to their regular line up. This is how the beer called Fire Escape came into being. They infused peppers with their escape artist pale ale, and people could not get enough. Beer infusing has not been done before in Knoxville. For a unique taste and experience, I hope you come out and try it. We plan on doing this once a month if it’s successful. Every month will be something different. Some ideas we are kicking around for the future are infusing a blonde ale with fresh cut strawberries, running an IPA through fresh whole leaf hops or trying vanilla bean pods and cinnamon sticks with a stout. One last thing I wanted to mention for this update is that Downtown Wine and Spirits has just gotten a new shipment of rare and hard to find beer. 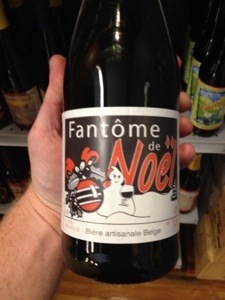 New to the store is Fantome Noel. They told me that they have asked for this beer for 5 years and got 6 of the 8 cases that came to East TN. 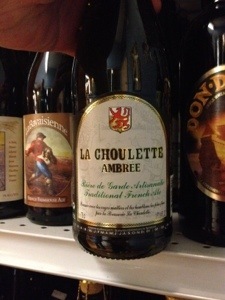 Achel Trappist Blonde, Shipyard Smashed Blueberry, Weissenohe Bonator Doppel Bock have also arrived. If you know about these beers, you know how hard they are to find. Much like the shipment of Sweetwater 420 IPA, these won’t be around long, so I suggest you get down there. Tell the guys Ratchet sent you and sign up for their email list. They just might hook you up with a discount. Well that’s my exciting news. 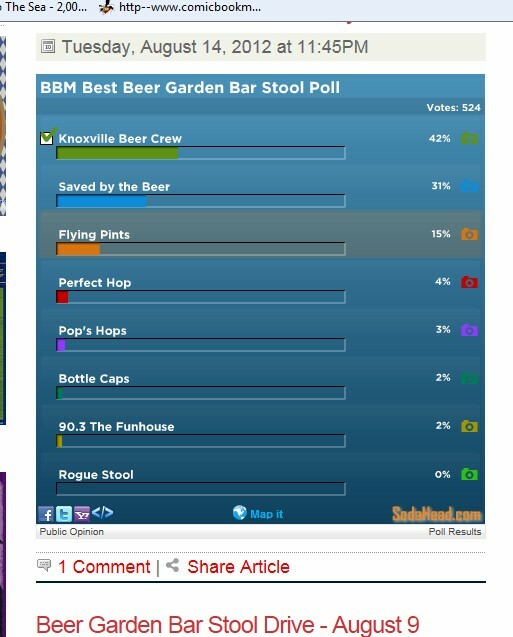 Please repost and let’s help the Knoxville beer scene grow. The more we support things, the more beers the distributors will see fit to bring to this area. That translates into more variety available to us craft beer lovers. The curse of the serious home brewer – upgrade fever. I’ve had a serious case of blogger’s block lately. This is the 3rd post that I’ve drafted since my last update. I deleted the other ones because they just kind of fizzled out. I’m sitting here and sipping on a New World Porter from Woodruff Brewing Company and I have finally figured out what to write about. I consider myself to be a serious home brewer. 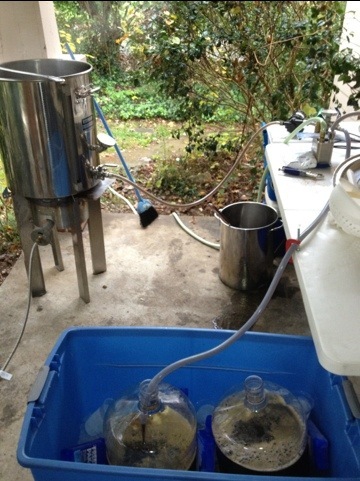 Everybody knows home brewing is my hobby, but I know very few other home brewers that invest themselfs in it like I do. Hell, outside of my family and my job, home brewing beer defines me. Where other people I know dream of saving for a vacation to the beach or buying new records or clothes, I dream of visiting breweries and buying better beer making equipment. Which is exactly what I have done this week. I’ve been lucky enough to make a little extra money on the side doing game day parking at my office. With it I figured I could buy some gear that will improve the quality of my brews. I’ve been looking at counter-flow bottling systems for several years now. Just like any purchase I make, it takes me an incredibly long time to make up my mind on exactly which brand I want to get. Each one has it’s own pros and cons to consider. I’ve been leaning towards buying the Blichmann Beer Gun for awhile. However, after further research and a conversation that I had with a pro brewer, I went with the deluxe version bottle filler offered by More Beer. I like that it fills from the bottom of the bottle up, and that it flushes out the oxygen with CO2 first. Up until now, I’ve been naturally carbonating my beer. This is done by adding priming sugar when I bottle. The remaining yeast cells eat the sugar and create the carbonation. I’ve made great beer this way, and have so for year. 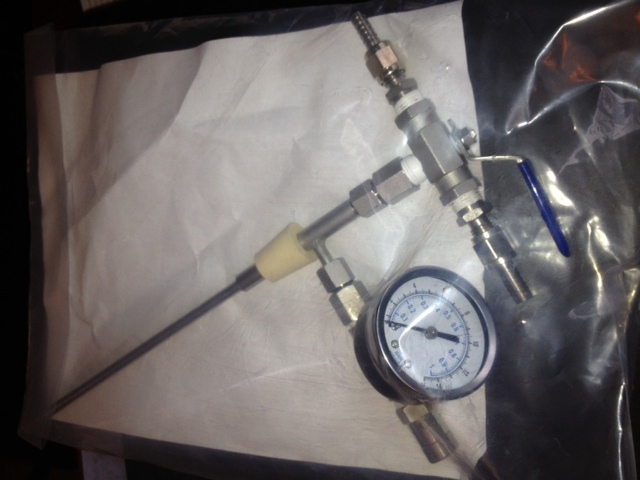 So how will using a counter-pressure system improve my beer? Well, hopefully in several ways. As great as bottle conditioning is, things can go wrong. Yeast can autolyze, creating off flavors. Too much carbonation and your beer can foam really bad when you pour it, or even worse, bottles can explode. Luckily, that hasn’t happened to me in over 10 years, but I still am careful to store my beers in coolers to minimize mess if it does. Oxidation is a big concern of mine as well. There nothing like going to pour a beer and realizing a whole batch has gone stale due to extra oxygen that was picked up during the bottling process. With counter pressure filling, I won’t have to worry about this so much. It’s pretty simple how this works. I’ll flush out the oxygen out of the empty keg with carbon dioxide and then keg my beer. Then I’ll force carbonate it. Whenever I want to bring bottles somewhere, I’ll simply sanitize however many I want, then fill them directly from the keg using the bottle filler. This should cut down significantly on the amount of storage space I need. Not to say I won’t ever bottle condition beer. In fact I plan on doing just that with a few from every batch. 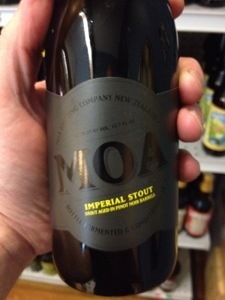 Some higher gravity beers, and styles like Imperial Stouts and Barley Wines benefit from extended bottle conditioning. Instead of going through the trouble of measuring out tiny amounts of bottling sugar, I’ll just use tabs. I don’t plan on bottle conditioning more then 10 beers out of every batch anyway. Another major reason I purchased the counter pressure filler is for non alcoholic drinks. My 7 year old son makes his own sodas (with my help & guidance, of course). We always keg his creations. The reason being is that to bottle conditioned soda, you have to use yeast which creates yucky off flavors. If we fill the bottles under pressure with already carbonated soda, he can bring them to a friends house, birthday party or whatever. Just like me and my beers, he takes great joy in sharing something yummy that he made with his friends. I can also give him all the clear bottles I keep, since you don’t have to worry about soda getting “light struck” like you do with beer. The other piece of equipment I purchased this week was a filtering system. I’ve been looking and researching these for awhile as well, but not to the extent that I have with counter-pressure fillers. Filtering will also improve my beer, mostly the look of it. Pretty much every home brewer has issues with chill haze. This is caused by proteins in the beer that make it cloudy when it’s cold. This doesn’t effect the flavor in any way. It’s really just an issue of presentation more then anything. My brewing techniques have improved significantly over the years, but I still get chill haze from time to time. Filtering may also help improve the flavor by taking out tiny particles of yeast, proteins and polyphenols. I purchased my filter from Home Brew Stuff. The one I bought I can also use as a infuser, which is what I think it will get the most use as. I can run my IPAs and Pale Ales through extra hops, and my Stouts and Porters through coffee beans or cacao nibs. Hell if I’m feeling adventurous, I can run my beer through fruit if I want. Which is what I may do if I’m serving it at a festival. Both of these upgrades are dependent on my kegging system. I currently have 6 five gallon corny kegs, 3 gallon and a 2.5 gallon. I’ll need to use 4 kegs to filter 10 gallons. I also have 2 Carbon Dioxide tanks, a 10 and a 5 pound. I have 2 regulators, one of which I need to get replacement gauges for. My beer fridge is a chest freezer with thermostat control. It has the capacity to fit all of my full kegs at once. The beer has to be kept cold in order for the C02 to absorb. I got the feeling that once I’m up and running at full capacity, I’ll be looking for more kegs and another chest freezer to add to my set up. I’ll cross that bridge if and when I ever get there. Ok, Random recipe, here’s a pale ale I plan on brewing Thanksgiving weekend. hold grains at 152 degrees for 60 minutes. bring to boil, add 1 ounce of Cascade hops. 30 minutes, add 1 ounce of Citra. Last 10 minutes add another ounce of Cascade. Last 5 minutes of the boil, add the whirfloc tablets. Add last ounce of hops at end of boil. Rapidly cool and pitch with 3 packages of Safale- US-05 dry yeast or Wyeast or White Labs California Ale Yeast. If you read this blog, I’d love to hear from you. I have more then a few beer and brewery stickers I have collected at festivals. The next 6 people to post a comment, I’ll mail you a beer sticker from my collection. A note about #StoutDay and the #KnoxBeer @Woodruffbrewing cask of it. 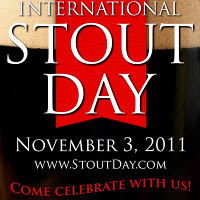 Today (November 3rd) is Stout Day which is described in this way: “International Stout Day is a worldwide celebration of the iconic beer style, Stout. Taking place in homes, pubs, breweries and restaurants; it’s all about celebrating the craft beer revolution, relishing in this beloved beer style, sharing your photos, tasting notes and events with the world.” This takes place nearly 3 months after IPA Day. These events are to raise awareness of these certains styles of beer, and are mostly a social media led phenomenon. I slightly conflicted about these “days”. On one hand, I personally don’t need an excuse to drink a good quality craft beer. These special days were mostly created by certain well know beer bloggers and seem to first and foremost be a way for them to extend their brand. 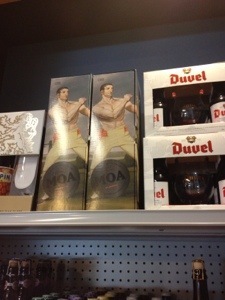 On the other hand, it does go a ways to create awareness of different styles of beer. It does give people an excuse to “drink outside of their comfort zones” and try a style that they might normally avoid. If someone who normally drinks Light American Lagers gets turned on to craft beer because of one of these specialty days, then it’s worth it. At the same time it makes me wonder how far naming these special days will go. Do we really need a day for every style of beer? What about Schwarzbier Day or Belgian Tripel Day? One things is for certain, it’s only a matter of time before someone announces another one of these days and the rest of the internet & social media spheres jump on board. Chances are, so will I.
I do want to add that my first craft beer experience was with a stout. I was a young adult (aka a Dumbass) who had just dropped out of college to go traveling with some friends (aka other dumbasses aka dirty hippies). We did shows and gatherings. On the “lots”, other more experiences dumbasses would sell beer. One of the most popular brands at these events (or whatever you want to call them) was “Sammy Oaties”, our nickname for Samuel Smith’s Oatmeal Stout. From my first taste, I was in love. For years afterwards I would only drink dark beers. It wasn’t until I became a homebrewer that I expanded my appreciation of other styles. A good oatmeal stout takes me back, and I still buy myself a “Sammy Oatie” every once in awhile as a treat. Speaking of Stout Day, my good Friend Dave Ohmer will be tapping a cask of Woodruff’s State Street Stout this eveing at 6pm at Dead End BBQ. This is another addition in his cask conditioned series. I will be there to support my local brewery, and if you are here in Knoxville, why don’t you make an appearance as well? Update: I took this picture around 6:15 pm. 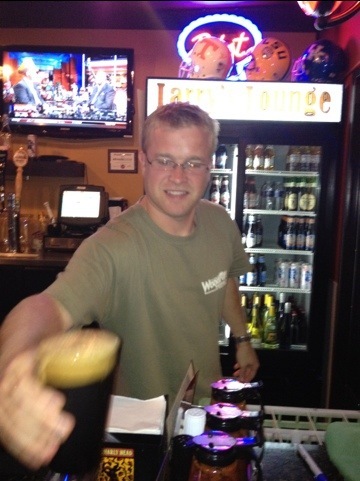 It’s my buddy Dave (the brewer) giving me a fresh pint of cask conditioned stout. Damn it was good! Yesterday I went and filled my water jugs at Love’s Creek Spring. I also set everything up on my porch so I could get the water going as soon as I woke up. My whole plan is to get done as soon as possible so I can take my son to “Scare in the Square” this evening. 5:40 am: Woke up before my alarm. I should get out of bed & get going. 6:00 am: Started water going, hoping to mash in by 7. 6:54 am: Mashed in. Hit my temperature with no issues. 7:00 am: Started Sparge water going. It’s on low since I have an hour to get it to 168 degrees. 7:28 am: Just stirred the mash, 30 minutes left to go until Sparge. 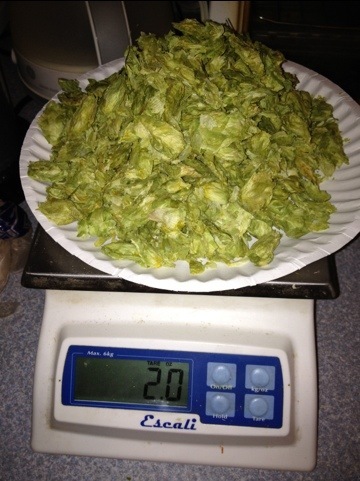 7:34 I’m now measuring my hops. This is my first true all whole hops brew. 9:03 am: finished Sparging, waiting to achieve boil. Only 20 more degrees to go. 9:40 am: yet another hop addition. Also working on cleaning out my mash run and sanitizing my carboys & cool down equipment. 10:10 am: boil is done. Turned off propane. Took out mesh bags full of hops & let then drain in a strainer. Going to start my whirlpool in a few minutes. 10:20 am: started my whirlpool. Going to do this for 20 minutes so all the trub goes to the center of the brew pot. 10:40 am: on to the cool down. It’s a lot easier to do on a cold rainy day. 11:02 am: cool down done & carboys are full! 11:24 am: starting gravity of the wort is 1.062. Tasty very hoppy, but it balances with maltyness & a hint of chocolate malt. No roast character which is good & within the style for this type of beer. Of course the flavor will change with fermentation. I’ve pitched the yeast & am awaiting the magic of fermentation. It’ll be awhile until I post again, there is a lot of clean up to do. 11:54 am: not even close to being done with brew day clean up, but must take a break. Hard work. 1:00 pm: Guess what? Still not done with clean up. I’m tired.